See that picnic basket? Its not a prop. Its their actual one from awesome travel they have done together. They stocked it with real goodies and mementos from home and we headed to Signal Hill as the sunset. Isn’t this gorgeous?! 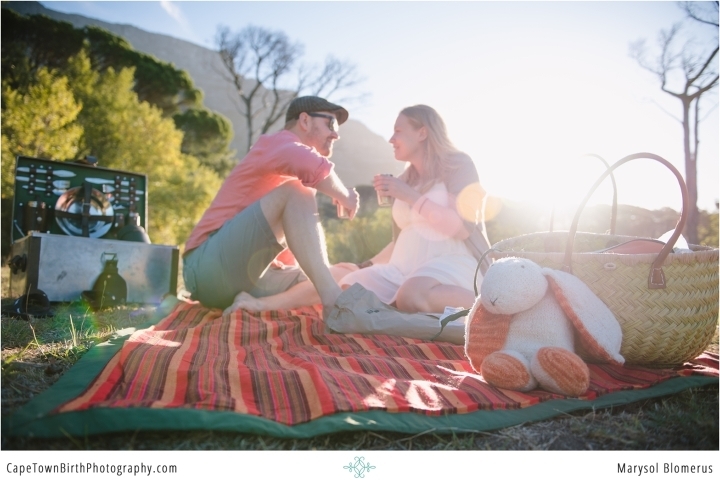 Picnics like these are part of what makes Cape Town so special. As they marked one of the last times they would be able to do this without organizing a babysitter or bringing along baby essentials, their friendship shines. When I walked into their home in the dark hours of the early morning, I saw this was really happening. With the candles flickering and hushed whispers and low groans, these parents were deeply connected and working through each surge, lost in labour land. There is something really sacred about someone’s home. You tiptoe even lighter. I was aware of not interrupting this incredible oneness they had going. So I did the only thing I could think of: hide behind the couch! Staying out of the line of sight, I quietly would lift my head every few moments and take a shot. The strength and power I saw in front of me were breathtaking. She completely trusted the process and her body. This birth was attended by Glynnis Garrod of Birth Options Midwifery Team (here’s a great interview with her) and their doula, Harriet Came. What I especially want to point out is watch how Glynnis and Harriet come close for the care they each provide, and pull back at so many points to give this couple time to bond with their baby. This birth really showcases the beauty of those first couple of uninterrupted “golden hours” right after a baby is born. Their birth had me on a high for days. The birth playlist they had going was the most incredible soundtrack to these beautiful moments, at times filling all of us with emotion. They created a sacred space to welcome their son, and it was my pleasure to document not only the events but the atmosphere. My thanks to them for hiring me. Be sure to work through the photos as well as the video. I’ve asked this mom to answer some of our burning questions on why she chose a home birth, what it was like, and what was on her birth playlist. Those will be intermingled in the photos, so don’t miss it! All shared with family permission. *This birth took place before Cape Town’s severe water restrictions. If you are planning a home birth in Cape Town or South Africa, here’s a great article I put together with another home birth mom to help in your research. If you would like your birth story documented, here’s where to contact me. Just days old, he’s so tiny. His grandparents have arrived to cuddle and help. For a lot of my expat clients who have family abroad, we coordinate a Meet the Family session depending on when they are coming. Ones like these at home are awesome. I don’t pose, just sort of follow the magic and maybe make a suggestion here or there. I loved this outdoor seating area this family had that made for the incredible light and relaxed lounging. You can never truly grasp how new a baby is until time has passed. You can’t understand the bittersweet of the newness of it all until its long gone. This was the early days of learning how to change him and getting to know his facial expressions. Its such an explorative time for a couple. We get to see the beauty that is being known. No one has ever gotten to know this little person like them. Bowen’s birth happened right at home, so all the more these photos have special significance in their location. This family was so great, I could have stayed and shot all day. My thank you to them for choosing me to document their journey. Meet The Family Sessions are in-home or in-hospital and are available as an add-on to any Birth Packages or Maternity/Newborn Packages. You can inquire here with me. When this mom first called me to say she was pregnant again, I was overjoyed for them. Then she asked to hire me again for this birth, and my stomach sank. If you didn’t read the story, I missed her son’s birth because it was too quick. First births rarely are that fast. Seconds are known for being faster. I just didn’t think I could live with myself missing both of them. I actually tried to talk her out of it. But their trust in me to be the one to cover it won in the end. I’m so honoured and happy it did. This one, I was bound not to miss. Even if it meant sleeping in her hospital room overnight for several hours “just in case”, which I ended up doing. I originally toyed with the idea of camping out on her front lawn, but pesky issues like caring for my own children stopped me. Details. Her pregnancy was a difficult one. She was hospitalized several times. Before and after birth. Anina was almost a premie. So many complications that are a part of her story of overcoming. Those are hers to recount. Know that the photos show the emotion, they show the hope, they show the connection, they show the joy of this child’s arrival. What they don’t show is a couple’s full story of what it took to get to that point. Anina’s parents covered her life with prayer and a belief that her life was to be. They stood on that faith. I invite you to see the video but also work through the photos. They tell the story in a different way. You will notice so many that aren’t even in the film. Even these images are just a selection from many more. When you hire me, you have the benefit of getting essentially a photographer and videographer in one with all my dedication to tell your story in every detail. To Anina’s parents, thank you for your unfailing trust. I do my best work when that’s there. It was my honour to be a part of this journey once again. What a beautiful four you are. 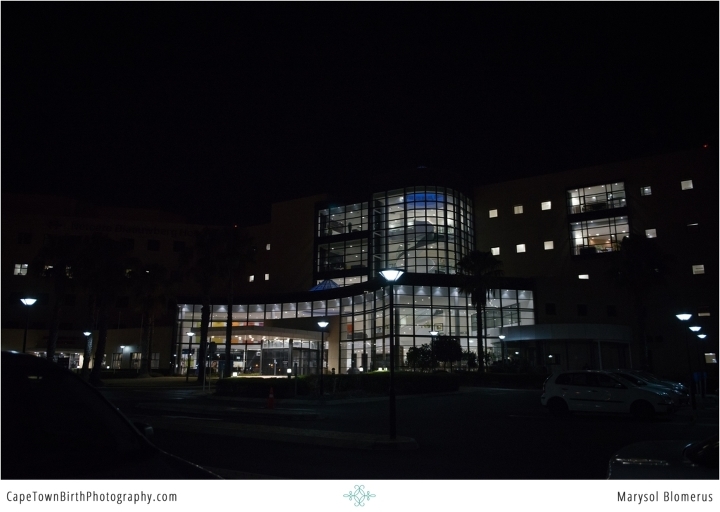 My thanks to Netcare Blaauwberg and the care providers who wished not to be identified but accommodated my presence that day. 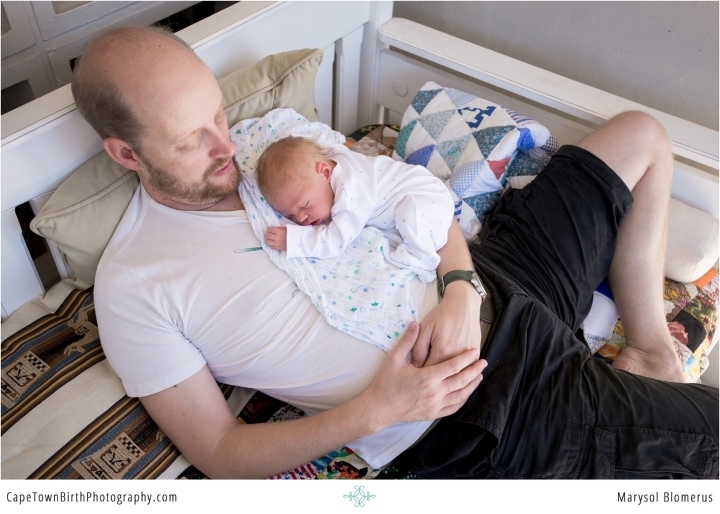 As always, birth stories are shared with parental permission. If you would like to talk about your baby’s birth day coverage, contact me here. Ben is no longer a baby, he’s on his way to being a big brother. Here’s his birth story if you missed it. What I love about incorporating an older sibling in a maternity session is the perspective and layers it adds. It’s not just your bump. There’s the context of how old they were when this chapter of your family story was happening. A pregnancy with a toddler is a busy one, you are running after while growing another. All the nuances of that we can capture when we include them. Maternity sessions like these also capture the love and friendship between a couple as they await their baby. This couple exudes that kind of affection even through a tough pregnancy and raising a toddler who is a gentle soul. She wanted something a bit different. I suggested this beach location that feels more like a desert with its white sands. I had never shot there at sunset, but I must admit I loved the yellows and pinks it as it was something magical. You would never guess this is Cape Town! Enjoy their awaiting-to-be- four family maternity session and then when their daughter was born. It’s beautiful! Mini Maternity sessions just like this one are available complimentary with all my birth packages. Maternity and newborn packages are available even if you don’t hire me for your birth. I focus on classic, clean, timeless images of all the relationships and dynamics of your family. All in colour AND black and white edits. Contact me here if you are interested in this for your journey to parenthood.